* Ruby's eating spree seems to have settled down a bit, but so has the 1 hour napping spree (which only happened once so it's not much of a spree, unfortunately). * The eating spree doesn't reflect any significant weight gain in Ruby so far. She's 14lbs 6oz today. No more than she weighed last week. She's gained exactly 1lbs in the past month. 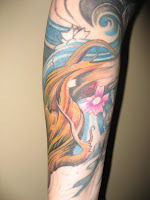 * My tattoo "guy" (he hates being called an artist) is friends with me on a certain "social networking" site. He saw pictures of Ruby and told me yesterday that they thinks she is adorable and should be in commercials... How's that coming from a tattoo guy? * The issue with the funeral has been resolved - my mom said she would take Friday off to look after Ruby so I can go. She said she needed a day off anyways and time with Ruby is always a treat. She's a good grandma. 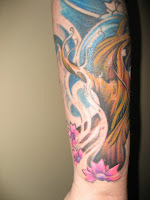 The tat looks awesome.I like the touch of pink, but it is your arm. Can't say much about the pacifier. I don't plan on using one - that could change in the blink of an eye though. I have about 6 on hand just in case. Not sure what the problem is supposed to be with a pacifier. I think I had one till I was five and Austin had one till he was three and decided on his own it was time to get rid of it. I don't see any detrimental effects from having used it? What's the word these days on using one? I had planned on taking it away at 6 months. Then I went to one of the IF boards and asked about how to phase it out. All of the mom's were surprised that I would take it so early...so I didn't and now I WISH I had! I have only ever given it to him in his crib or in the car, but now in the mornings when I try to leave it in the crib he catches an attitude. Mom wins, but she hates fighting the battle. *Your tattoo looks amazing! I personally think that the pink looks fabulous! The tree looks great too! *I think the soother should be at your discretion... do what works for you two. I love the bubble gum pink. Love it. I hope you end up liking it, too. It looks awesome. As for the pacifier, I was lucky enough that Ellie didn't ever really like it. At 4 months, she just kinda said, "enough" and hasn't had it since then. I, on the other hand, had mine till I was 3.5 years old. My mom had a hell of a time getting it away from me. In the end, it's your call. Ellie liked teething rings and such better, like the little plastic key rings.